Most of the full-page pictures are divided into two or more panels. This one, however, has a single unified image of the mouth of Hell. Formed of the maws of two hideous, gigantic monsters, it swirls with the chaotic figures of the damned, including kings and a queen wearing only their crowns and a tonsured monk, as well as young and old, male and female. 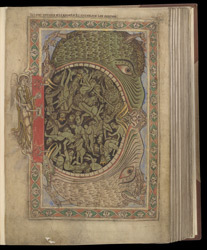 They are tortured by slimy, hairy demons, while an angel locks the door in the border with a large key, a feature seen in an 11th-century Anglo-Saxon picture of hell.